Concept proposed by Killian Pacific — and designed by PBOT — as part of the Lovejoy Square mixed-use development in the Pearl District. A developer has offered to pitch in $250,000 toward a significant upgrade to the bikeway and sidewalk on NW 14th between Kearney and Lovejoy. 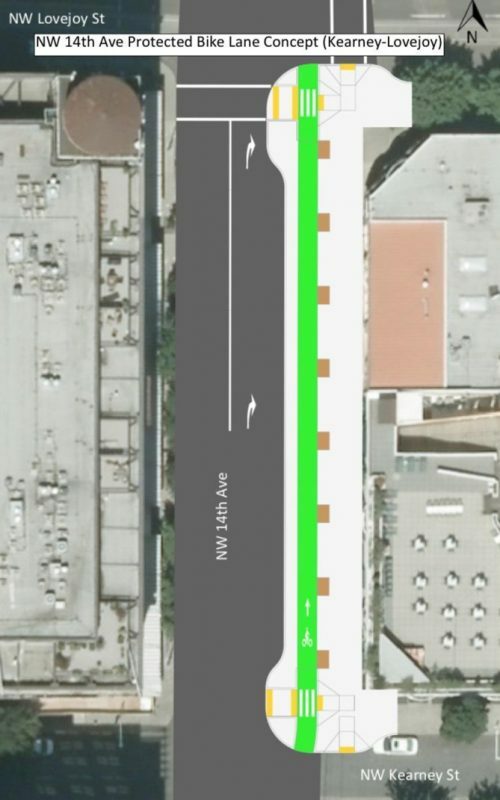 A preliminary drawing of the proposed street upgrades done by the Portland Bureau of Transportation (above) shows the bike lane and sidewalk concept. By extending the curb 25-feet to the west, it would be a significant change to this block of 14th (which is one-way northbound). As we detailed during our NW Portland Week coverage last year, NW 14th is a key piece of the bike network that leaves much to be desired. The current cross-section has five lanes: a bike lane sandwiched between two standard vehicle lanes and two lanes used for auto parking. 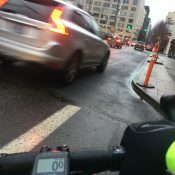 One block south (at the REI store) is a door-zone bike lane. Aerial view of current conditions. Current conditions on NW 14th looking toward Lovejoy. 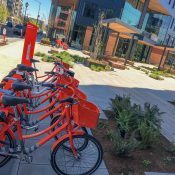 “As a gateway into the neighborhood from I-405 and an edge street with few stop-controlled intersections, NW 14th Avenue can often feel hostile for pedestrians crossing on foot and bicyclists riding along northbound. The current condition of the block in question is a vestige from the era where this location was primarily industrial in nature and when the Lovejoy viaduct touched down at NW 14th. The 16-foot wide right turn only lane on this block of 14th creates an excessively long crossing distance (50 feet) between curbs, which increases exposure to passing car traffic and detracts from the pedestrian experience which is highly uncharacteristic for this eminently walkable neighborhood. 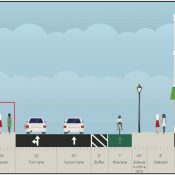 The setback crossing reduces the visibility of pedestrians waiting at the NE corner of 14th and Kearney, while the expanse of pavement encourages motorists to increase speeds and reduces safety for bicycle riders that are navigating the existing merge point. From here the developer will have a month to refine the concept with PBOT and come up with a more detailed plan and cost estimates. If you’d like to tell BDS how you feel about this, you can email comments to Planner Puja Bhutani at Puja.bhutani [at] portlandoregon.gov. You can also testify at the Design Commissioner hearing today (12/21 at 1900 SW 4th Avenue – 2nd Floor – Room 2500B) or at a follow-up hearing on January 25th. 14th ave is, end to end, the worst bicycle-infrastructure enabled street I’ve ridden in the city core. I never use the bike lane, it’s too dangerous. I’d welcome the addition of actual protections here. This is amazing! Absolutely top-notch infrastructure. When people see how great this block is and how terrible other blocks are in comparison, maybe it’ll create some urgency to replicate it again and again. This is a world-class bike lane. Finally, a world class, SAFE proposal from the city! Oh wait… from a developer?!?!? And that, in a nutshell, is why I’m so frustrated with PBOT. This is the caliber of design that PBOT should be pumping out citywide. Not painted lines and occasional bollards that are constantly ran over. I’ll take it where we can get it I guess, but how amazing would it be if PBOT was this visionary and assertive? That design actually came from PBOT. But not the budget or the political will. Glass half full: This quality of infra doesn’t exist *anywhere* downtown (unless you include Moody). This bike lane, AKA showing people what’s possible, is a fantastic first step to building political will. Given that this is unlikely to be built for at least 2-3 years, I really hope it isn’t a first step. That’s actually what concerns me the most: Would this be part of an entire street redesign, or is this just going to be for one block? 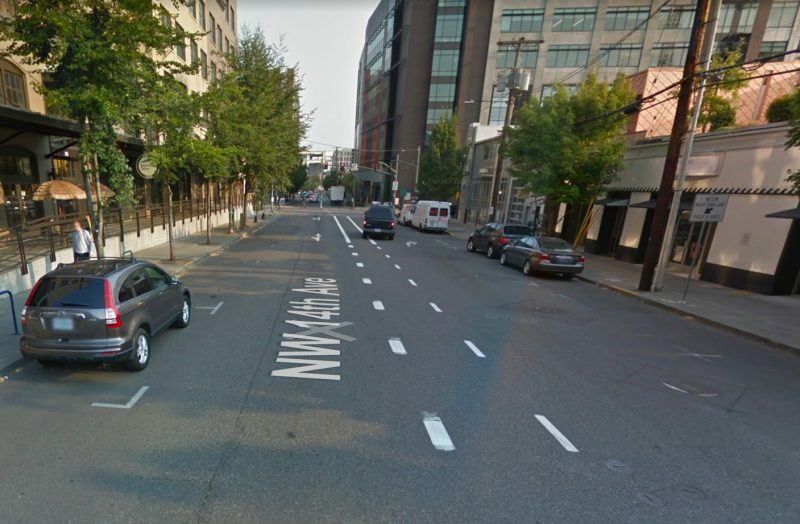 When Amazon paid for protected bike lanes for their Seattle offices, it was only for the three blocks of 7th Street on the land they owned. This left most of 7th and the surrounding areas without any other infrastructure to get to the bike lanes. Inconsistent infrastructure from block to block can be more frustrating than no infrastructure improvements at all. So unless your neighborhood is gentrifying, good luck getting developers to pay for improved bike facilities. The smart growth coalition wins again. Over the last 10 years developers have paid PBOT $75 million in Systems Development Charges. Those are used to build capital projects all over the city, and neighborhoods like the Pearl that see a huge amount of development generate a really large proportion of those fees. In this particular case the developer will probably contribute somewhere over $400,000 to the citywide SDC fund, in addition to the ~$250,000 they’re spending on the transportation improvements immediately adjacent to their site. The developer can absorb that cost because they’re building a 10 story building with 78 apartments and about 30,000 sq of office space (on the same amount of land taken up by four single houses in an R5 zone). 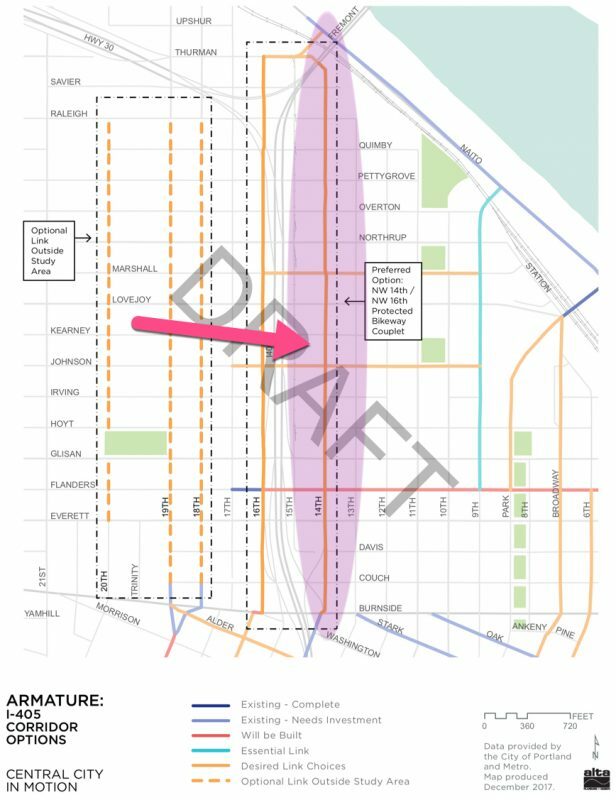 Maybe if other neighborhoods stopped freaking out over 4 story buildings on their main streets and allowed the kind of density that the Pearl allows they’d find that developers could afford to build protected bike lanes there too. Wish we could get the infrastructure without building another viewless glass and aluminum canyon. Seems like any block in the Pearl with buildings only a few stories has it’s days numbered. Might as well re-name it NoWa since it’s starting to look just like the South Waterfront. The West side will soon be a wall of glass from Ross Island to NW Kittridge. But I’m just a curmudgeon who remembers nighttime urban biking the train yards under the Lovejoy viaduct columns up to Bridgeport brewery, back when you could only grab a slice of pizza to go with your beer. I listened the audio of yesterday’s Design Commission hearing. The Commission was strongly in support of the proposed right-of-way improvements, and other unrelated changes the architect made since their first hearing. This project will almost certainly be approved in January, with a condition requiring that these upgrades to NW 14th be incorporated into the Public Works Permit. Does anyone know if this new intersection will also prohibit “right turn on red” once it is constructed? Yes, that’s standard practice in the MUTCD and I trust that it would the case here as well. This is quibbling, because the improvements sound great. But I’ve always questioned the idea of height bonuses for things unrelated to building massing. When the zoning code states a height limit, it’s really saying, “This is the tallest building that’s appropriate for this location”. 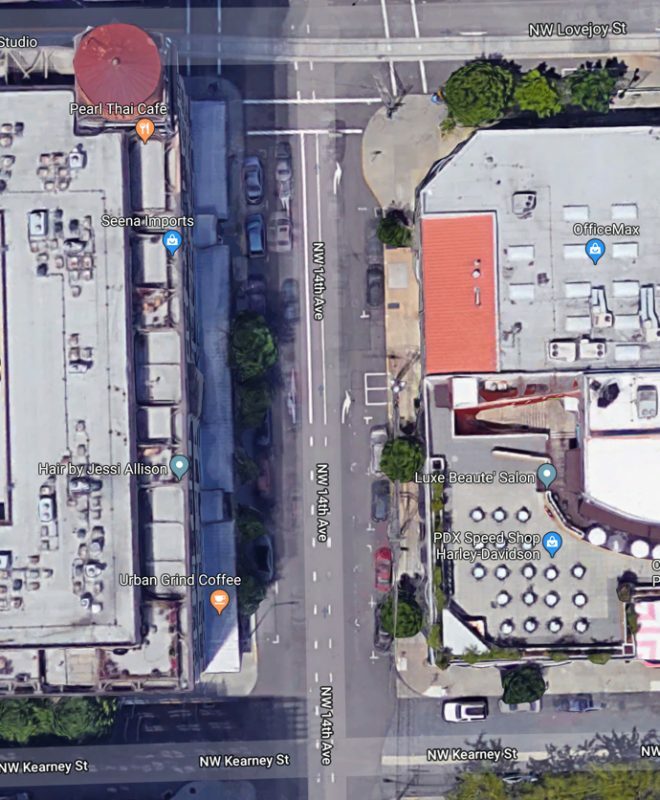 If a developer says, “We’d like to build four stories taller, and in return we’ll make the massing of the building narrower, which will mitigate the negative impacts of blocking light and views that the taller building will have” that to me makes some sense to grant extra height, because of the direct mitigation. But bike infrastructure (or affordable units, or artwork or most things the zoning code will accept for bonus granting) are unrelated to height, so granting height bonuses for them means the code is saying, “This is the tallest building that’s appropriate for the site, but go ahead and make yours taller”. But there are benefits to the bonus system. So instead of the code saying, “This is the height limit, but you can go higher if you provide amenities from our bonus list”, it would seem better to set the height limit higher (the highest that can be achieved through bonuses) and say, “This is the height limit, but you can only build that high if you provide amenities from our list”. Again, it’s quibbling, because the resulting development would be the same, but I think that’s a more honest, logical approach. To add to this I also think that any system that relies on an ad hoc determination of whether the “give” for the bonus is sufficient opens up huge opportunities for corruption, or at least for the people who approve the bonuses to steer money to their pet projects. There are a lot of cases where giving smart bureaucrats the discretion to make decisions on what’s best for the city are good. I don’t think it makes sense for them to be deciding which developers’ urban design plan (whether that’s a bike lane or a park or whatever) is a sufficient payoff for the city to permit a taller building. It would really seem to invite a sort of corruption where the developers need to curry even more favor to the zoning board than normal. At 148′-6″ to top of parapet the project is almost maxing out the 150′ of height that’s allowed on that site (for now; next year the allowable height will probably go up to 250′). In this case 90′ of the height limit is earned automatically, and the remaining 60′ allowable height is at the discretion of the Design Commission. The zoning code explicitly allows them to approve additional height in this locaiton if they find that the “increased height will result in a project that better meets the applicable design guidelines”. I’m only pointing this out to make it clear that nothing is being proposed that’s beyond the zoning that is already in place for the site. The connection is admittedly a little tenuous, but in this case the developer is saying that with the extra height they’re willing to do something that wouldn’t otherwise be required, and that thing meets a number of the design guidelines in ways not typically seen in other developments. This project was approved on January 14th, with a conditions that require the protected bike lane to built as part of the project.